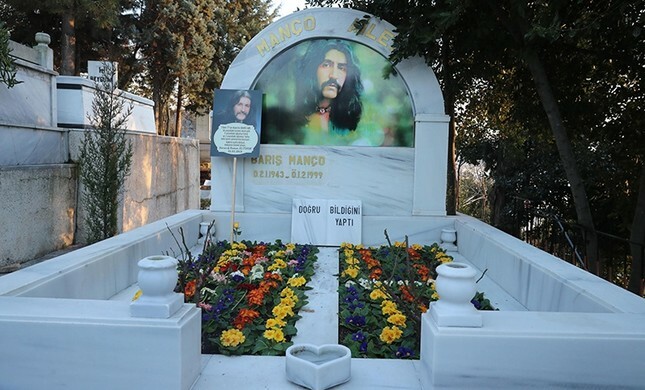 The legendary Barış Manço was not forgotten by his fans on the 20th anniversary of his death. Manço’s house, which has been transformed into a museum in the Moda neighborhood of Istanbul’s Kadıköy, hosted many visitors until the late hours of the night. Around 2,000 people visited the museum during the museum's open hours. Twenty years have passed since the death of Barış Manço – one of Turkey's most renowned rock musicians and composers. The globally well-known artist's house in Istanbul's Moda district hosted many fans on Thursday to mark the anniversary of his death. The house, which was converted into a museum in previous years with the efforts of Kadıköy Municipality and Manço's family, was opened for free visits until midnight on Jan. 31 in respect to the death anniversary of Manço. "Barış Manço is one of the biggest values raised by this country, one of the people who deserve the title of artist," one visitor said. "He is someone we know from Moda. He has never seen himself as superior like some people who had such a reputation. He was one of us." "Everyone has good and bad moments in their lives, but Barış Manço did not leave us any bad memory. He was always a commoner, so he always deserved the title of artist," the Manço fan said. Another visitor, Çağatay Güvenç, said he has been growing his mustache into the style identified with Manço between the anniversary of the musician's birth – Jan. 2 – to his death date. "Barış Manço was an example for all of us... We came here for his memory. As usual, we did not forget this year. I have been coming here for last five years and we will never forget. I do not grow a mustache normally. I do it for his memory only between the anniversary of his birth and the anniversary of his death." Manço was born on Jan. 2, 1943, in Istanbul. Because of the ongoing World War II, his family named him Barış, meaning peace in Turkish. He received his early education at Istanbul's Galatasaray High School and later graduated from the Royal Academy of Fine Arts in Belgium in 1969. He studied graphic and textile design. In 1978, he married Lale Çağlar. The couple had two children together, Doğukan Hazar and Batıkan Zorbey. Considered the father of Turkish rock, Manço recorded his first singles in the early 1960s with his next band, Harmoniler (The Harmonies), which is one of the first examples of the Anatolian Rock genre, which combines elements of Turkish folk music with rock. In 1970, he formed the band Barış Manço Ve... (Barış Manço and...) – recording his first hit single, "Dağlar Dağlar" ("Mountains, Mountains"), which sold over 700,000 copies. He later formed the legendary music group, Kurtalan Ekspres in 1972. He performed with the band until his death. His first and only live album was released after he toured Japan with Kurtalan Ekspres in 1996. With his long hair, silver jewelry and unique costumes, he was best known for his musical performances. Manço wrote and recorded more than 200 songs over the span of his career, some of which were translated into other languages, including English, Japanese, French, Italian, Greek, Persian and Arabic. Manço also traveled to nearly 150 countries for his popular TV program "7'den 77'ye" (From 7 to 77). He was honored as the Turkish Culture Ambassador of Belgium in 1987, Turkish state musician in 1991 and received the Order of Chivalry in Art and Literature (1992) from France along with many other prizes. Manço died of a heart attack on Jan. 31, 1999, just before the release of his album Mançoloji, celebrating his 40th year in the music industry. Millions of people attended his funeral in Istanbul.